If you are taking your car by ferry to Le Havre then these easily accessible towns should be on your map. Le Havre, in the northwest French region of Haute-Normandie, is a modern city (the old buildings having been mostly destroyed during World War II) that takes culture and architecture to its heart, and because of this it has been made a UNESCO World Heritage Site. Wandering around Le Havre, visiting the impressionist art museum, seeking out one of the only surviving original buildings, the Shipbuilder’s House, and generally soaking up the new, vibrant atmosphere is a great way to spend a day. But if you have more time, and you are staying nearby, there are some other wonderful towns that are only a stone’s throw from Le Havre, each one easily accessible by car or public transport. The picturesque town of Honfleur is around thirty minutes (about 16 miles (about 26 kilometres)) from Le Havre by bus (or car), and the contrast between the two places is stark. 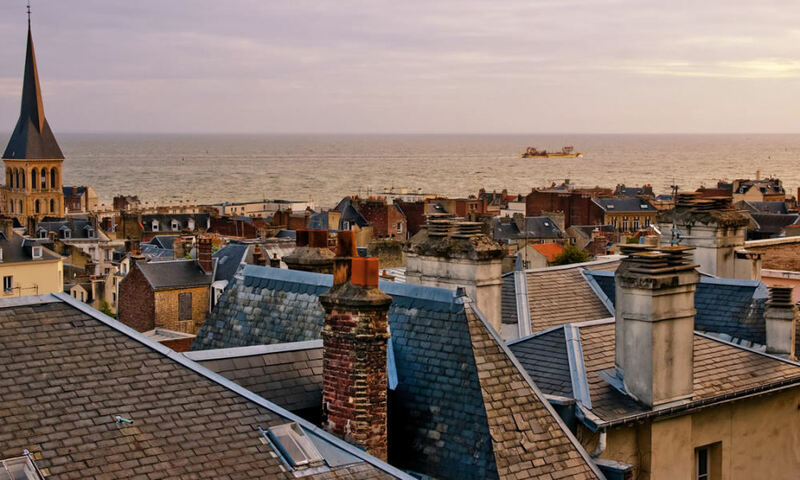 Le Havre is famed for its modern, concrete architecture, whereas Honfleur is all cobbled streets, beamed buildings, and plenty of history for those who love to learn. For a sport of lunch there are literally dozens of street terrace cafés to choose from, each one just as quaint and as good as the next. Take your pick and sit back to enjoy the ambience of a pretty little harbour town that takes pride in its reputation and its appearance. There is plenty to see in Honfleur including the church of Sainte Catherine, built in around 1500 in the shape of a ship’s hull. The church has a famous wooden bell tower that can be climbed at certain times of the day. There are museums too, including one dedicated to impressionist painter Eugene Boudin. There are ninety-two of Boudin’s works within the museum, and for fans and newcomers alike, it is a treat for the eyes. If nature is your preference then Le Jardin des Personnalités will certainly bring a smile to your face. There is a nature reserve within the beautiful gardens which is perfect for bird watching. If it’s raining, there is no need to worry as there is the Naturospace, an indoor tropical garden housing hundreds of gorgeous butterflies. If Honfleur can be said to be homely and quaint, then Rouen is its more sophisticated, older sibling and is around 57 miles (about 92 kilometres) from the port. With impressive stately gothic spires that rise towards the heavens from the stunning (and open) cathedral, the skyline of Rouen is something that, once seen, will never be forgotten. There is history here too. In 1431, Joan of Arc was burned at the stake as a heretic in the town square, and this infamous space has become something of a place of pilgrimage for many. World War II lay waste to much of Rouen, but, unlike Le Havre, the town was rebuilt in its former Gothic style. Not only can this be seen in the cathedral (called Notre Dame, not to be confused with its more famous Paris counterpart), but there are many buildings around the town (including the Palais de Justice) in which the sixteenth century has been brought to life. Étretat is a treat for those who love the natural world. Its famous cliffs are a sight to behold, shaped by centuries of nature to form archways that can be spied as you walk along the lovely coastal path. This French seaside town is around 17 miles (about 27 kilometres) from the port of Le Havre and is famed for its golf course that takes in the most majestic views. If you enjoy a game of golf it would be a shame to miss out on playing eighteen holes here! For the literary minded, Étretat is home to the museum of Arsene Lupin, a fictional detective created by Maurice Leblanc. So popular is this detective that he has fans across the world who journey to Étretat just to step foot inside this house turned museum. Fascinating stuff! Book a sailing to Le Havre.